This week's anime is going to be a weekly post that I will start covering what anime I watched that week. For the most part it will be one anime series a week unless I feel the need to post more than one. Seeing as I watch anime everyday I thought it would be a good idea to share what I watched that week and give brief thoughts on it. 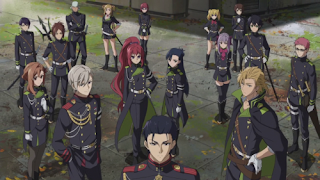 This week's anime is Seraph of the End. What better way to end the year off then with my favorite anime of this year and maybe all time. 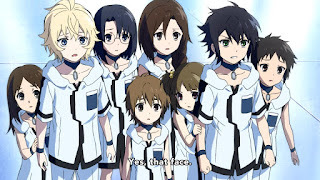 Seraph of the end is about a young boy Yuichiro and his best friend Mikaela who are orphans trapped under vampire rule and used as livestock. Vampires came to rule the world after a mysterious disease wiped out majority of mankind. Tired of being slaves the pair hatch a plan to escape with the rest of the orphans but end up being caught and killed all except Yuichiro who manages to getaway. After escaping he stumbles upon a group of human fighters called the Demon company. They are called this because of the weapons they wield have demons trapped in them, and are the only weapons effective against the vampires. He agrees to join them as long as he gets to kill vampires for revenge. Along the way he will meet several other characters who will become his companions on his quest to wipe out vampires. This is the main plot but as the anime progresses the plot thickens and we discover new things and all is not as it seems. Seraph of the End kept me on the edge of my seat episode after episode. I have always been drawn to vampire or werewolf stories so this was no surprise that I would enjoy it. I did not how ever think the animation, story, and music would be as good as it was. This is one of those anime that sets itself apart from the rest of the pack. The second season just ended this past week so if you have time do yourself a favor and put this on your list of anime to watch you won’t regret it.